One of the most popular tools natural health practitioners and personal trainers use to help speed up weight loss is something called “carb cycling.” Carb cycling and weight loss have an interesting semi-complex relationship that we will disassemble below. Carb cycling is where you alternate periods of low and higher carbohydrate content in your diet. This means you might spend five days eating low carb, and then eat more moderate carbohydrate for two days on the weekend. So advocates of carb cycling say that the best thing you can do for your health and waistline is eat low carb most of the time, but still be deliberate about including carbohydrates every so often. Honestly, I personally don’t do carb cycling in any serious manner (though I do pay attention to the science I describe to you below), and I don’t recommend it for everybody. (Here are some great fat burning tips I do recommend for everybody). For a lot of women I work with, it is important to consistently eat carbohydrates. What women benefit from eating carbohydrates? Nevertheless, carb cycling is a real, effective tool for fitness and weight loss when used correctly. The problem is that it is not always used correctly. Here’s why, and what to do about it. The #1 mistake I see people making with carb cycling and weight loss is inattention to the specific needs of the female body. The idea of carb cycling comes from fitness gyms and online forums (and some scientific studies, though not too many). It is a rather “bro-y” concept. A) Thyroid status must be protected. There are two important facts here: estrogen slightly increases, and progesterone decreases insulin sensitivity. Estrogen and progesterone are elevated at different points in the menstrual cycle. Estrogen levels tend to be the most dominant in the first and second weeks of the cycle (especially the second week). Progesterone levels are at their highest in the third and fourth week of the cycle. The female body is naturally more insulin-sensitive in the follicular phase (the first two weeks of the cycle) when estrogen levels are highest and progesterone levels are at their lowest. This means it tolerates carbohydrates in these two weeks better than the rest of the time. 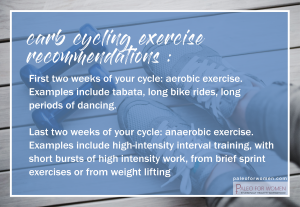 I have talked with fitness professionals like Luke Robinson of Wolf Pack Fitness fame at length about the diet and exercise recommendations they make for women who carb cycle. 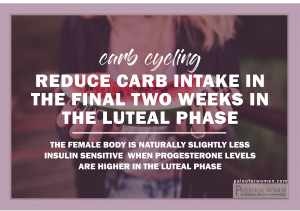 They usually recommend that their clients reduce carbohydrate intake in the final two weeks of the cycle, in the luteal phase, when insulin sensitivity is at its lowest. This means that in the first two weeks of the cycle carbohydrate intake might be completely ad libidum or whatever-you-feel-like. That may be too vague for you! If you want a hard and fast number to adhere to, maybe 35 percent of calories or 200 grams of carbohydrate a day is a good place to start. It can be at its absolute highest in the second week of your cycle, around 45% of calories. This number varies based on how much you exercise, of course. The more you exercise, the higher that number can be. In the second two weeks of the cycle, when insulin sensitivity is at its lowest, carbohydrate intake should drop to about 100 grams of carbohydrate a day, which is approximately half of what their clients were doing previously. The actual numbers are less important to pay attention to than the ratios: insulin sensitivity and weight loss are maximized when carb intake is cut in half in the second half of the cycle. It is also important to note that I recommend carb levels do not drop below 100 grams a day. That is my preferred number for a lower limit for women, so as to prevent fertility and thyroid problems. You can find out more about what I recommend for carbs, weight loss, and other paleo tricks, in my extensive book on weight loss for women, Weight Loss Unlocked. Fitness gurus also recommend a corresponding shift in type of exercise. Finally, for more on my unique thoughts on carbohydrates and weight loss for women specifically, check out my program for weight loss, Weight Loss Unlocked! You can read all about it here. Do you have experience with carb cycling and weight loss, especially with your cycle? How do your hormones affect your diet and fitness? When you write about grams of carbs per day, do you mean total (including fiber) or net (subtracting fiber)? What are your recommendations for those of us who are post-menopausal? GREAT QUESTION. You don’t have to worry about a cycle. 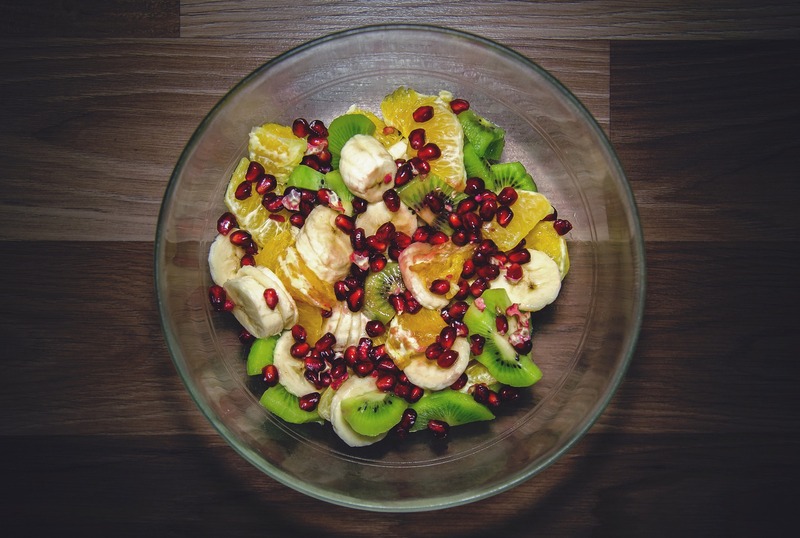 Of course it varies woman to woman, but after menopause i think it’s probably totally healthy to carb cycle the ‘normal’ way – that is, to do some days on and some days off, however many of course works best for you. This is good information for women who currently still have a normal cycle. I’m 45 and although I am not currently in menopause, I have to take birth control pills to supplement my hormone levels. I am also 40 pounds over weight and struggling to find the right solution to lose this weight. How would carb cycling work for someone in my situation? Um, more of both, why can’t you eat any more a day? Where do fats factor in for the follicular phase and the luteal? Can you help me figure out when I am supposed to do high carb days and low carb days? I’m very confused about this program but really want to try it. I am 42, 5’1″ and 160. I work out 3 times a week. I am pre-menopausal. My goal is to loose weight. Thank you for any help and advise!!!! In terms of the 4 week cycle.. The first 2 weeks when you eat the most carbs, is this the the 2 weeks after your period or prior to your period? Can you tell me what I can do for carb cycling when I go through this horrible hormone changes and still try to lose body fat and weight?